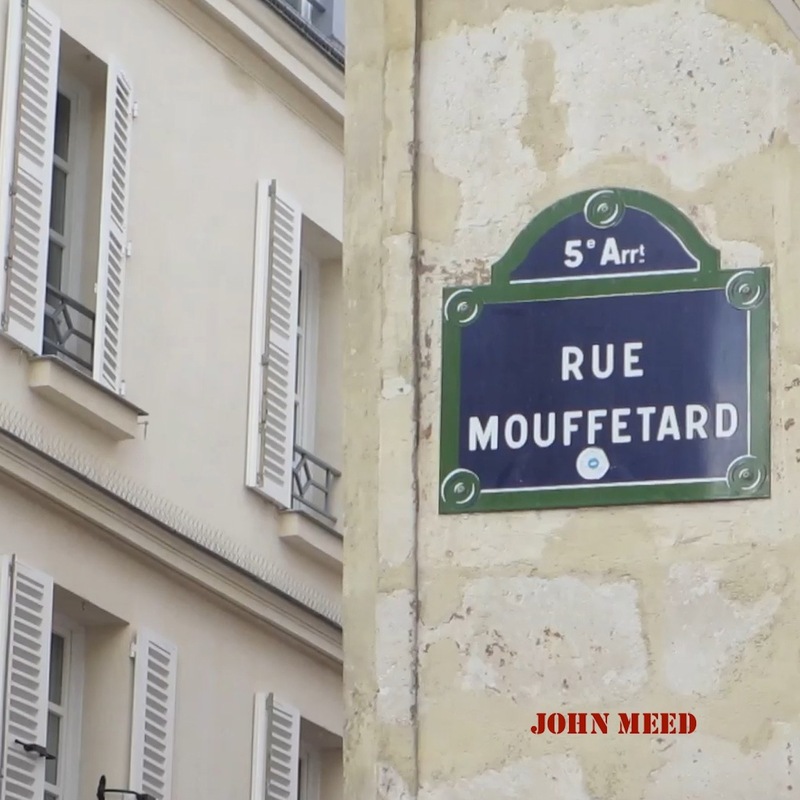 Rue Mouffetard is the first single from my fifth album, ‘The dust of time‘. It features Dawn Loombe on accordion, Rhys Wilson on piano and additional guitars, and Brian Harvey on bass. Here is the video for the song; it is also available for listening or download here. 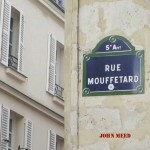 La rue Mouffetard, in the 5ème arrondissement of Paris, is my favourite street in the city. It runs down the hill from the Place de la Contrescarpe to the Place St Médard, lined with cafés, shops and market stalls, and steeped in history. Its course has remained unchanged in 2000 years since the Romans built it as part of the road linking Paris with Rome. The quarter has not always been as relatively genteel as it is today. As Paris expanded out into the surrounding villages in the eighteenth and nineteenth centuries, the Faubourg St Marceau attracted poor workers from other parts of France and beyond. It developed an insalubrious reputation, smelling as it did of the tanneries along the River Bièvre. 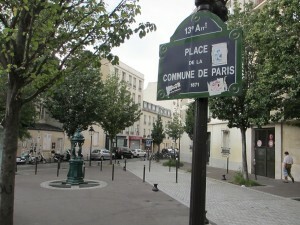 Hugo set Les Miserables in the neighbourhood and in 1834 Balzac referred to it as ‘the grimmest quarter of Paris’. As with other working-class areas of Paris, it helped fuel the revolutions of 1789 and 1848. Its steep slope spared it the attention of Baron Haussmann, who destroyed many of the mediaeval streets of the city while constructing les grands boulevards, and during the Paris Commune of 1871 the barricades went up again. 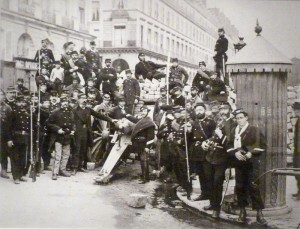 However, as the Commune ended in the Semaine Sanglante, troops from Adolphe Thiers’ army stormed up the street to crush the barricades. The customary massacre and mass executions in the gardens of the École Polytechnique followed. 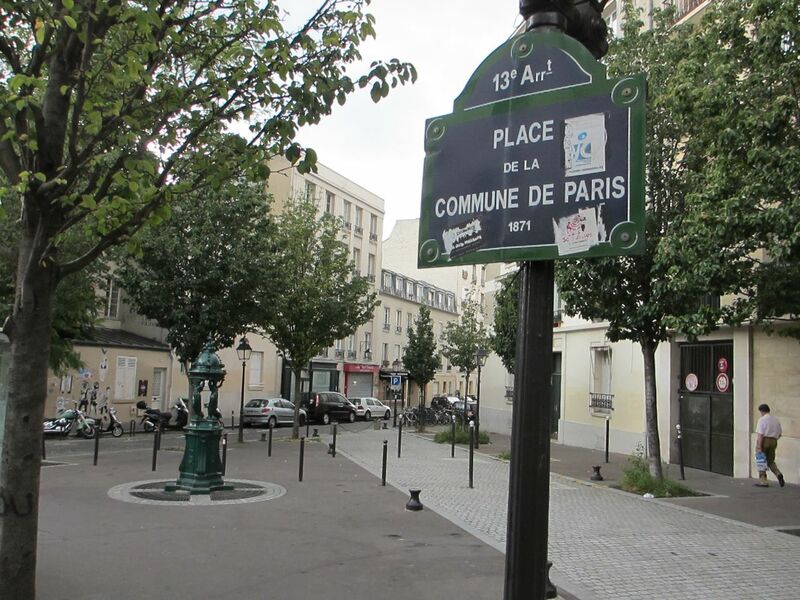 The nearby Butte aux Cailles lasted a day longer and is now home to La Place de la Commune de Paris and a café organised as a workers co-op and named after Le Temps des Cerises. This song, written by Jean-Baptiste Clément five years before the insurrection, has remained associated with the events of 1871 and indeed Clément was later to dedicate it to Louise, a young ambulance worker who joined him on one of the final barricades. The area continued to attract artists and writers – Verlaine lived nearby in the 1890s and Hemingway, Joyce and Orwell spent time there in the 1920s. Scenes from the films Amélie and Trois couleurs: Bleu were filmed in the street. The quarter has now become attractive with tourists and students, but retains a distinct, almost village-like, feel – especially when friends meet up again after Paris’s annual August break over breakfast in the Cave la Bourgogne, while purchasing cerises in the marché, or while browsing the shelves of local bookshop l’Arbre à Lettres (recently bought by its employees). At such times you feel far from the frenetic centre of Paris. Cambridgeshire has long declared war on grass. The fens to the north of the city and the low chalk hills to the south have all been put to the plough, and at this time of year provide a monotonous vista – black to the north and brown to the south. 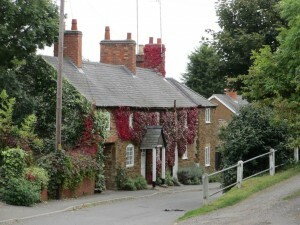 To find the pleasing green of meadows and pastures you have to head west, and so on the last day of September we set off for the Rutland/Leicestershire border and Tilton on the Hill – a typical village of the area with quiet streets of warm stone, perched on top of a 200-metre high ridge. We tumbled down the hillside in the direction of Lowesby, disturbing the tranquility of flocks of sheep and flights of sparrows. After a while we crossed one of Beeching’s disused railway lines – though remarkably the isolated Lowesby station is still intact and lovingly cared for. It put me in mind of Michael Flanders’ ‘The Slow Train‘ – ironically just a day after I had learnt that his daughter Stephanie, purveyor of the rampant market economics that had cost us our rural railways all those years ago, had left the BBC to join J P Morgan. As the sun burst through we picnicked overlooking Lowesby church, surrounded by munching cattle and watched by wheeling buzzard, red kite and kestrel. A passing walker told us of the 100 bus which still runs from Leicester to Melton Mowbray through these villages, somehow surviving Osborne’s cuts, and allowing fellow walkers to leave their cars at home. 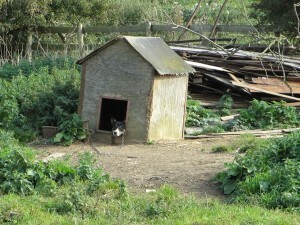 Moving on from Lowesby we wandered through more fields of rich green to Hamner’s Lodge Farm, another survivor from a lost age when farmyards were less tidy, more ramshackle and full of animals. A largely unconcerned ‘guard’ dog looked vaguely in our direction, leaving it to the cattle to warn disgruntledly of our passing. 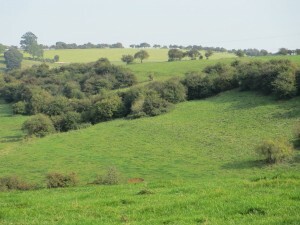 From the farm we continued to climb back up the escarpment amidst clouds of linnet and charms of goldfinches. 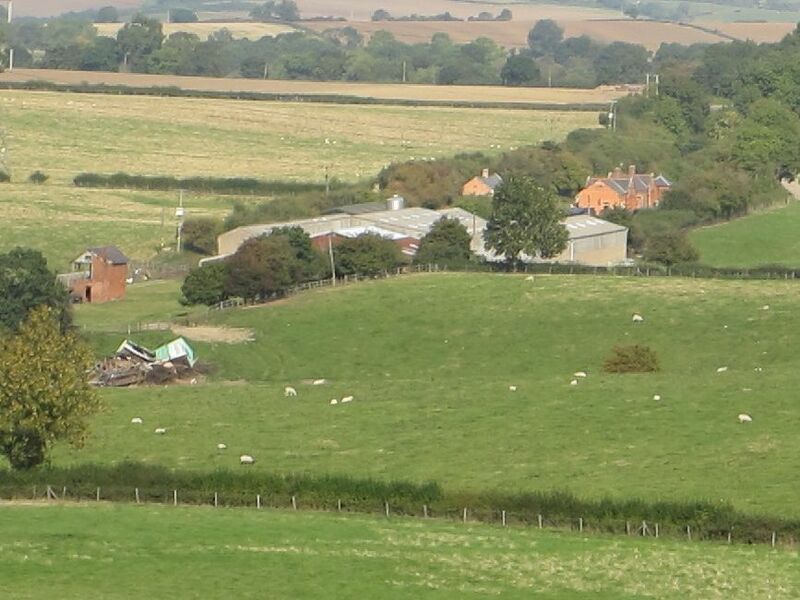 We stopped again for a while to soak in the views west to Charnwood and far beyond towards the Peaks before turning back into the easterly wind towards Tilton and thence home.